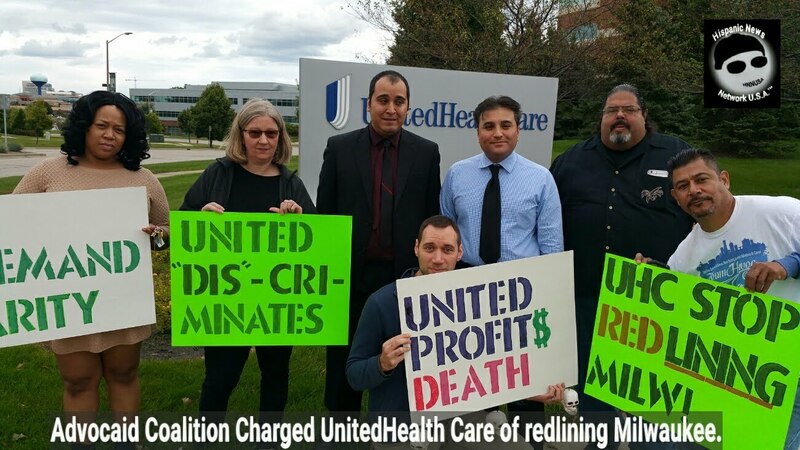 UnitedHealth Care is accused of redlining the City of Milwaukee by denying increased services and contracting clinics to deal with the opioid epidemic that has claimed hundreds of lives by overdose and lack of preventable treatment. 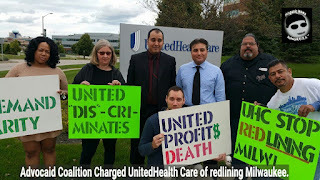 Milwaukee, WI – On Thursday, the Advocaid Coalition (AC) claimed that UnitedHealth Care (UHC) continues to redline the City of Milwaukee by denying comprehensive services and contracting clinics to provide the needed treatment for opioid addicted individuals who are heroin users. AC held a press conference at the UHC Midwest Corporate Office located at 10701 W Research Drive in Milwaukee, WI. According to AC, the heroin/opioids overdoses have increased in Milwaukee and released the following statements. “The body count increases every month. As more and more people die from addiction, because they are unable to get proper comprehensive treatment, UnitedHealth Care enjoys double digit profits as many die from overdose of heroin/opioids in Milwaukee,” said Robert Miranda, spokesman for the group heading up the press conference, Advocaid. “It appears insurers have been having issues implementing parity according to substance abuse treatment programs. The Parity Law was made with the express purpose that an insured person has equal access to mental health and substance abuse treatment as opposed to other benefits of health insurance. Most Intensive outpatient programs (IOP) in the area are facing difficulty with getting some insurers to cover benefits in substance programs according to what the law should permit,” said attorney Imran Kurter legal counsel for the group. The group says that clinics which specialize in treating patients suffering from addiction, specifically opioid use disorders such as pain pill abuse and heroin have been decreasing in Milwaukee while the death rate of heroin overdoses continues to increase. “We believe that comprehensive care clinics are being closed because big Insurance companies like UnitedHealth Care are red lining. 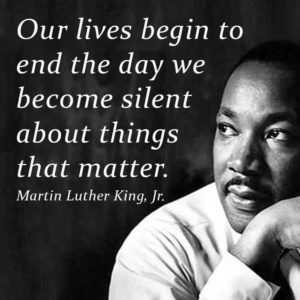 They are denying our inner city residents the right to proper treatment in their own back yards. Comprehensive care clinics were created for this purpose, to serve the people of their communities in their communities,” Rafael Mercado of the group MKE Heroin Diaries. Mercado says, if UHC doesn’t help in providing additional intensive treatment service clinics in Milwaukee, a protest against UHC will be the next option. “When UHC denies someone coverage to go to an intensive outpatient treatment, they have no other recourse, but to seek a way to numb the pain they are hiding and the easiest way to do that is to go to the nearest heroin dealer and pay $5.00 for a opioid pain pill, which normally you pay $600 to $700 for it with prescription,” Mercado stated. “In Northern Milwaukee there is only one major state certified outpatient clinic that has the full capacity of services such as intensive services (IOP) with Medication Assisted Treatments (such as Suboxone and Vivitrol), comprehensive case management, psychiatric mental health care (Dual Diagnosis with medication management), AODA groups, individual counseling, and continued outpatient treatment after intensive treatments,” continued Miranda. Dr. Kurter stated, “In 2016, UHC claimed $185B in revenue, which is double the reported amount in 2008. This year, UHC is expected to make $200B in revenue. Last year, UHC CEO, Stephen Hemsley claimed compensation of $31M dollars. With this fellow profits, why are they denying life saving treatment? UHC can you please answer this?,” Dr. Kurter asked. According to Miranda, the West Grove Clinic is the only full treatment service outlet for opioid addiction and has a backlog of more than 800 patients and the United Community Center in the Southside of Milwaukee has partial treatment services and refers most opioid addicted patients to other service treatment clinics outside of the city, including West Grove Clinic. The Milwaukee County Medical Examiner’s Office reported on September 6, 2017 that so far, there have been 101 fentanyl-related deaths compared to 96 in 2016 and 65 more fentanyl-related deaths are expected. Hispanic News Network U.S.A. contacted the UHC Communications Director, Tony Marusic on Thursday, but declined to comment about the allegations of redlining the City of Milwaukee by UHC. AC has launch its website highlighting UHC lack of parity for Milwaukee area residents suffering from addiction. The website: www.unitedforparity.com will be asking for area residents to contact the group regarding their experiences with UnitedHealth Care.